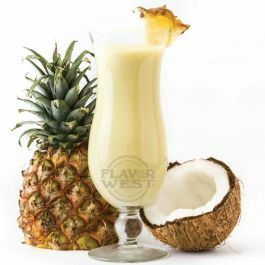 Pina colada flavor is a blend of pineapple and creamy coconut flavoring that gives a delicious taste in drinks. A drop of Pina colada flavor inspires great aroma and enhance flavors sweetness taste in cake baking, ice cream, pies, pastries, beverages, candies and more. Type: Piña Colada Water Soluble Flavoring. Ingredients: Natural and Artificial Flavoring, Propylene Glycol and Ethanol. USP Kosher Grade Flavoring. Usage Rate: 15-20% for E-use. Flavor Suitability: Suitable for beverages, baking products, candy, lip balm and more. Specific Gravity: 1.05 No Returns on Flavoring.